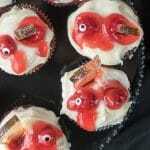 Red velvet cupcakes are dressed up like zombies with some fun tricks! Butter a 9-inch by 12-inch baking sheet or dish and set aside. Note: this will create thick glass (about ¼ inch) as seen in the photos. Should you desire thinner glass, use a regular size cookie sheet instead. In a heavy, medium sauce pan combine the sugar, water and corn syrup. Heat over medium heat, stirring constantly until the sugar is dissolved. Affix the candy thermometer to the side of the sauce pan or if handheld insert periodically until the thermometer registers 300 degrees (hard crack). Remove mixture from heat and quickly stir in the flavoring. Pour and scrape the mixture into the prepared pan, carefully avoiding touching the mixture. Spread to evenly cover the bottom of the pan or baking sheet. Allow to fully harden. After the candy has fully hardened, use a heavy kitchen object (I used a meat tenderizing hammer) to strike the candy allowing it to form triangular ‘glass’. Turn the pan over onto a counter top to release the candy glass. TIP: I put a cutting board over the top of the pan and flip both the cutting board and pan over to release the ‘glass’ without a mess. In a separate bowl or large liquid measuring cup combine the shaken buttermilk and oil. Spoon the melted chocolate into the mixing bowl along with some of the flour. Running the mixer on medium speed allow the mixture to combine. Slowly pour some of the liquid mixture into the mixing bowl allowing it to incorporate; continue to alternate the remaining flour and liquid, ending with flour. Add the red food coloring to create a deep red tone. Mix until just combined; do not overmix. Using a mixer, cream the butter on medium-high speed until fluffy (1-2 minutes). Add the cream cheese, vanilla and salt; continue to mix on medium-high until combined and smooth. Add 1 cup of sugar and beat on low speed (increase speed after the sugar is incorporated) into frosting, followed by 1 tablespoon of the lemon juice. Repeat, alternating the sugar and lemon juice, until they have been incorporated, finishing with the 1/2 cup of sugar. Frost cupcakes when they are completely cool. Frosting can be covered and placed in the refrigerator while the cupcakes cool or to stiffen before frosting if desired. Using a dining spoon, scoop a cherry from the pie filling can. Gently insert a candy eye into one of the two holes in the cherry. It should sit on the edge of the cherry so it is visible. Gently place the cherry eye and gel onto the cupcake. Spoon another cherry with gel where a second eye would be were this a face. Dip the end of the candy glass shard into the pie filling and insert it through the second cherry. Drizzle more cherry pie filling gel for a bloody effect if desired.